Born Hungary, Tamás Gyurcsó started his musical education at the age of five. Today, he plays the saxophone, clarinet, flute and piano. He started studying and specialising in jazz in Budapest, where he spent five years playing alongside some of the best Hungarian musicians and groups, from trios to sextet formations. 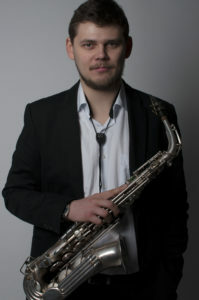 He moved from Italy in 2010, and continued his studies, obtaining a masters in jazz saxophone at the prestigious Conservatory of Music G. Verdi of Milan. There, he played with internationally renowned musicians like Corcoran Holt, Uri Cane and Paolo Fresu, among others. Now in London he has quickly established a musical and teaching career. Keep an eye out for him in any jazz club around the city! I studied music in Budapest, Trento, and Milan. My favourite piece of music is John Coltrane’s “A Love Supreme”. My instruments and my music. John Coltrane and my teacher, Robert Bonisolo. I grew up in a small town called Szerencs in the north-east part of Hungary.